We’ve finally turned the page on the calendar and entered February. Snow is lightly falling outside my window, temperatures are hovering in the 20s, bread is rising in the kitchen and Perry wants to lounge on my keyboard. And it’s also crunch time at the new building. Rick moved his business to it’s new home on February 1st even though we were no where near ready for him. 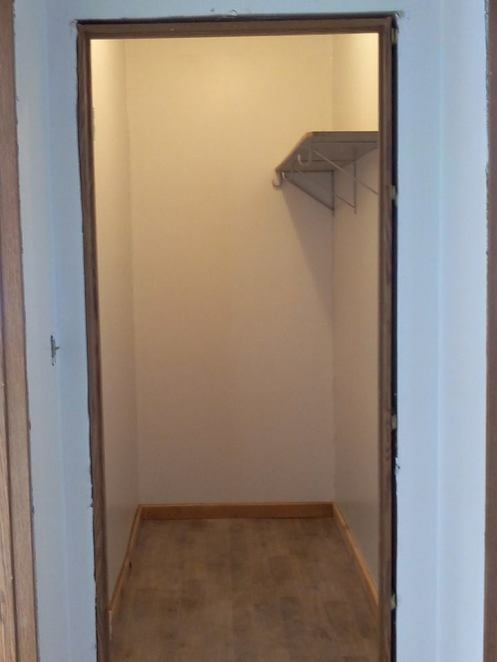 But he couldn’t justify paying rent at the old place while we were heating the new one, so we constructed a temporary wall to “hide” the construction and opened the doors to customers. I’ve put my notice in at the college and my last day there will be March 27 with hopes of opening up the coffee shop in April. I haven’t set an exact date yet because I’m not going to open up unless things are 100% done and perfect for my customers. There are so many things to accomplish, but every day that that we can cross something off the list means that we are one step closer to success. 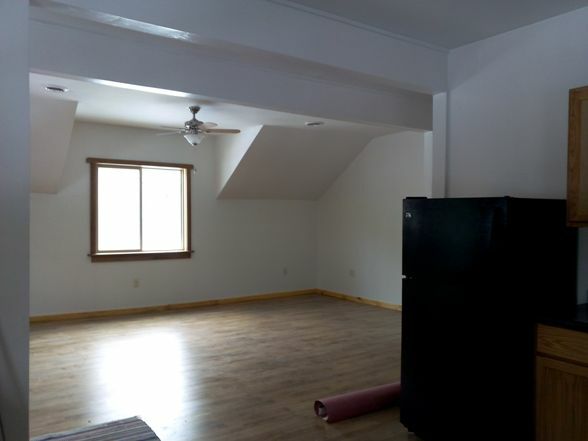 One item that has been completed is the upstairs apartment and we have a fantastic renter. She will take care of the place and appreciates all the custom work that has gone into the place. 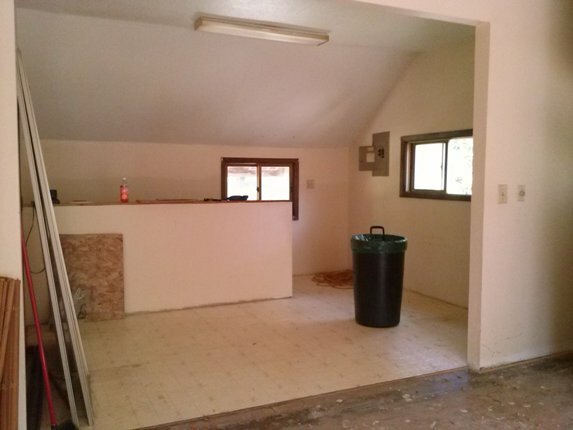 When I look back at the pictures of what that space started out as and what it is now, I am just blown away. 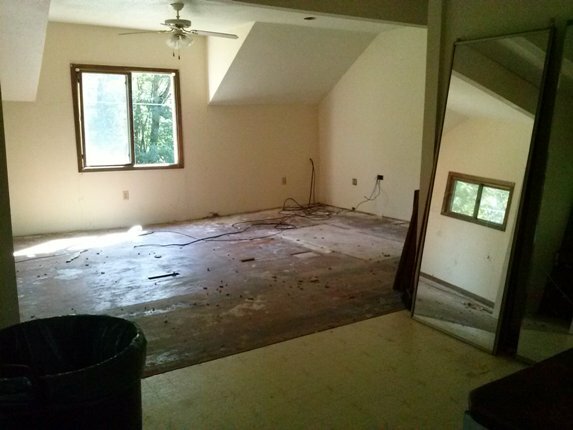 Here are the before and after pictures of the living room. WOAH!! Rick custom built a door to cover the furnace. Yes, he is an artist. This hallway looks much more inviting. 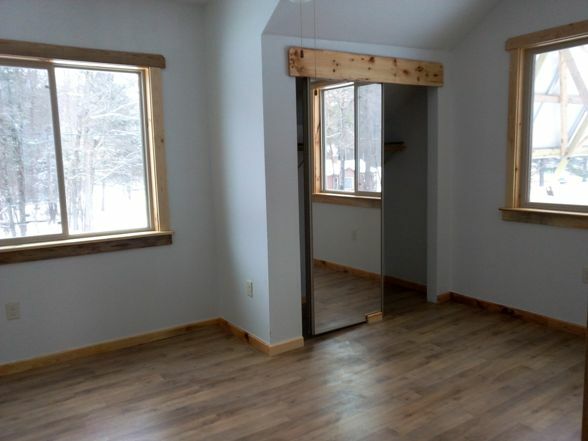 We were able to reuse the mirrored closet doors in this bedroom. 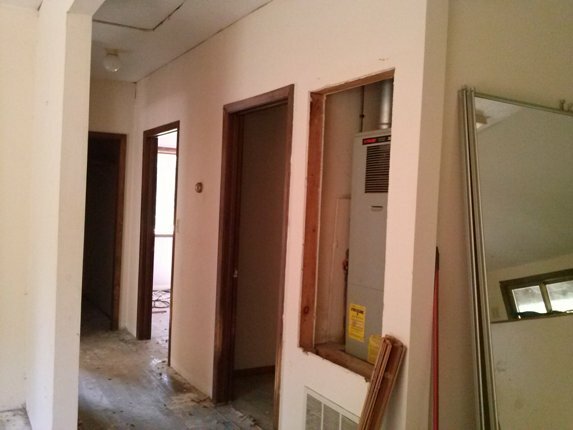 All of the trim in the apartment was reclaimed pieces that had been torn out from the building earlier, cut, routered, sanded, poly’d, and brought back to life. 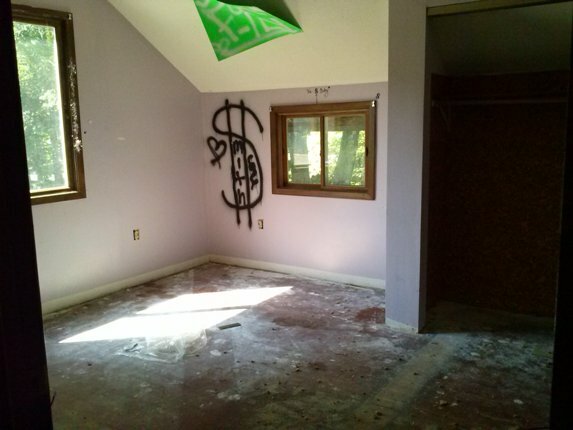 This bedroom was lovingly referred to as the room from hell with the purplish paint and spray paint graffiti. What a jewel it turned out to be! 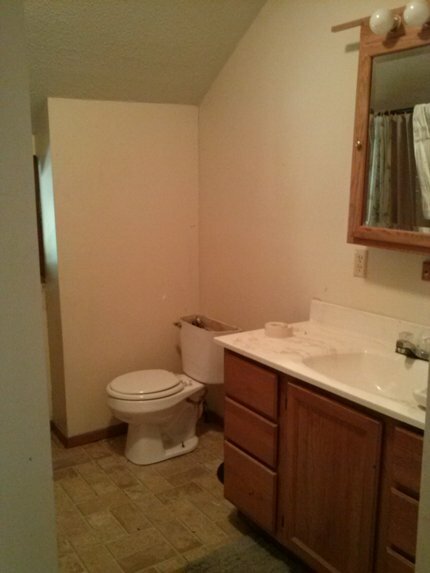 The new commode and flooring really update the bathroom. 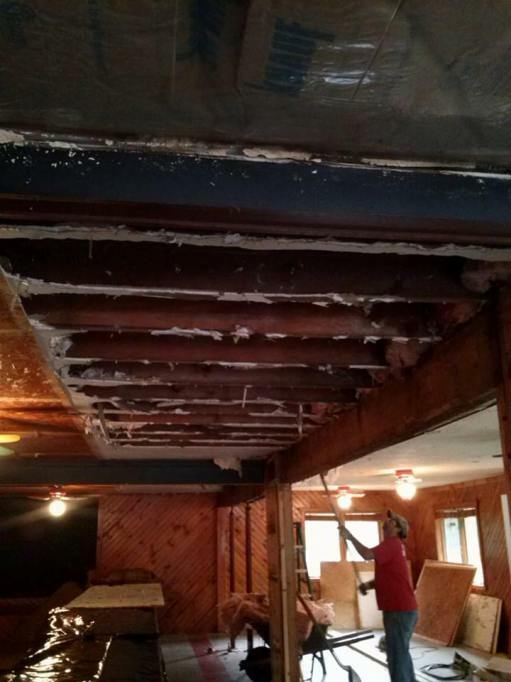 I had the pleasure of taking a sledgehammer to the kneewall that hid the stairs coming up from downstairs. 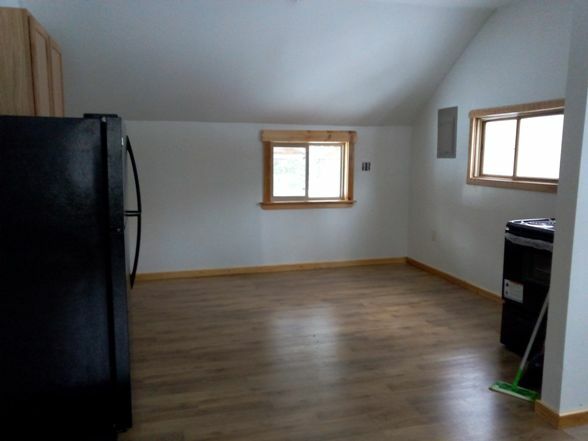 With those gone the kitchen is more spacious, and all new appliances and cupboards have been installed. Now we are fully concentrated on the downstairs retail areas that are taking on a transformation all their own. I can’t wait to share those pictures with you! Oh my gosh and golly has it been a while since I’ve had a chance to sit down and put my thoughts and life out there for whoever to ponder. It is still Winter here in the Northwoods, and we survived the January arctic weather that chilled our area for a couple weeks at the beginning of the month. If that is the worst that we will see for this season, I, and many people within a hundred mile radius, will be very grateful. I don’t think we will forget the hellish cold we went through last winter for many years to come. We are half way through January, quickly approaching February. Still lots of time to spend with Old Man Winter yet, but I’ll take an early Spring if he’s so inclined to hand it over. It is amazing how life moves along in a blur sometimes. The holidays came and went more quickly than normal it seems, and it was such a joy to take a few days off to spend with family. Grandkids have a way of making you smile. I’m trying to not get too caught up in the two-steps-forward-and-one-step-back curveball that life is throwing at us lately. The “It is what it is” attitude is a much better place to be. Plus the weekend breakfasts that Rick prepares are the icing on the cake. Life is consumed with working on the new building, and we have come to our first crunch time. Rick will move his business on February 1st, and whether we’re ready or not he will be in business. But here’s the real reason why this post is being written. It’s all my MIL’s fault. Georgia and SIL Roxy came up this weekend and worked their backsides off in the new building. 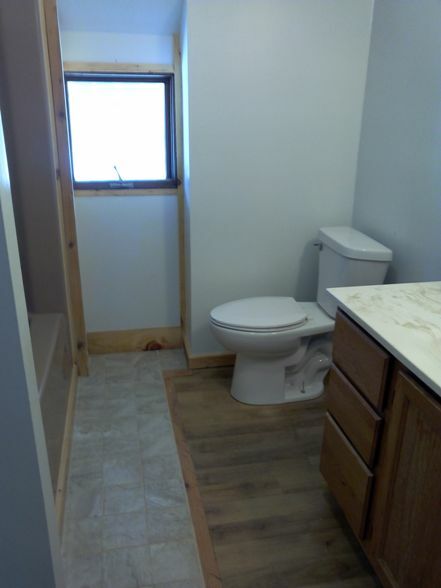 They did the final cleaning on the rental unit, and scrubbed the two bathrooms in the business section of the building to a shine that I never thought would have been possible. I bow to these women. They are amazing. They are also crazy because they offered to come back up and do more work. And in between all of the crazy was Georgia telling me that my nephew and his wife said thank you for writing this blog. She also heard from other family members that they were wondering why I hadn’t written anything lately and that they really enjoyed by writing. Knock me over with a toothpick. I never knew that my ramblings and daily life could be interesting to anyone. Or maybe it’s just Thor and Perry that you enjoy seeing. 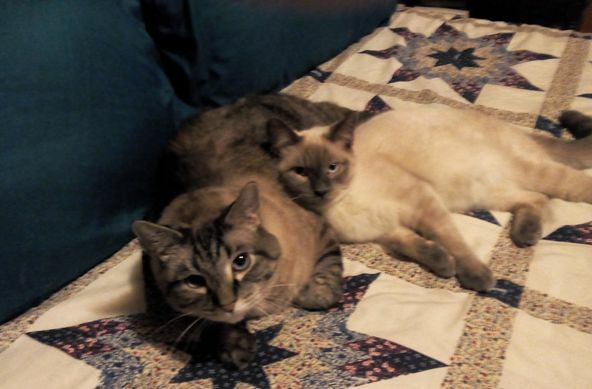 I agree that they have a certain cuteness factor, as well as a crazy side that they only share with me. Thank gawd that they do, because sometimes that’s what I need to get by from day to day. Each Christmas I think about holidays of the past, especially those when I was young. There were certain traditions that my family always had, such as Christmas Eve, which was always spent at my Grandma L’s house. There was the traditional Norwegian supper with Lutefisk and lefsa. I remember the riced potatoes and scalloped corn that my cousins loved, as well as the counter filled with sweet pickles, rosettes and sweet treats that my Grandma had made. There was always the “kids” table that you never seemed to graduate from because there was never room at the “big” table. That dining room wasn’t very big at all, but it always seemed to expand to fit however many people were in it at the time, and I estimate it was well over 20 people. We always had the singing around the piano as the women of the family cleared the table and washed the dishes. The sons would always serenade their mother with a Norwegian song, and she would sing along, seeming lost in memories she never revealed. In the middle of opening all of the gifts, which was done one person at a time so Grandma could watch and collect all of the wrapping that we had to gently peel back from our gifts so that it could be used next year, the familiar jingle of bells would be heard outside the front door that meant Santa had just dropped off a sack of goodies for everyone. Aunts and Uncles and cousins would continue to arrive at the house well into the night. A special toast was served after everyone had finally arrived, with a tiny glass of wine for the adults and grape juice for the young ones. It would be well past Midnight before we would pack up our presents and head home, where Mom would tell us to hurry and get to sleep so Santa could come. I remember lots of little details that are so much a part of that night that if they didn’t happen, it just wouldn’t be the same: the short needle Christmas Tree with candles on it; the movie “Yours, Mine and Ours” on TV in another part of the house; ice skating on the frozen river; waiting for my Uncle to come in from milking the cows so we could eat; seeing how many people we could hide under the pile of coats on Grandma’s bed; which cousin would make the first funny comment about the Lutefisk. This tradition may be gone, but my Dad has kept another one going all these years: the Christmas lefsa. 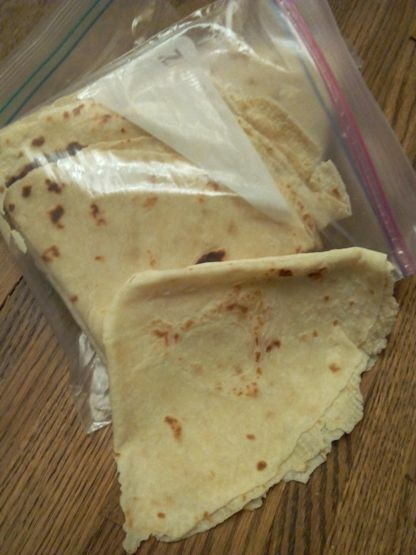 As I’ve grown older and moved farther away from my hometown, Dad has always made it a point to ship me some lefsa. There are a few women in my hometown that still practice the art of turning potatoes into a Norwegian flatbread (as I’ve heard it referred as) that will melt in your mouth. Slather that stuff with butter and brown sugar and it is the best thing in the world to eat! This year, however, Dad outdid himself with his gift. Not only did he add Christine and Nichole to the list of receivers, but he included a pound of butter to the package! Opening that present put a big smile on my face. Grandma would be proud, Dad. Oh my gawd. Would you look at the calendar? The last time I wrote to ya’all it was almost Fall, now it’s almost Christmas!! Where HAS the time gone. Well, for Rick and I, the time has gone into the new building when we aren’t working or sleeping or tending to other things that seem to pop up in life. Fortunately, we have forced ourselves to take a break here and there. We managed to break away for Thanksgiving and travel to Nichole’s to enjoy a wonderful meal and lots of lovin’ from the Grandkids. Those little ones aren’t so little anymore and they keep their folks plenty busy with sports and school activities. Before you know it they’ll be off to college. 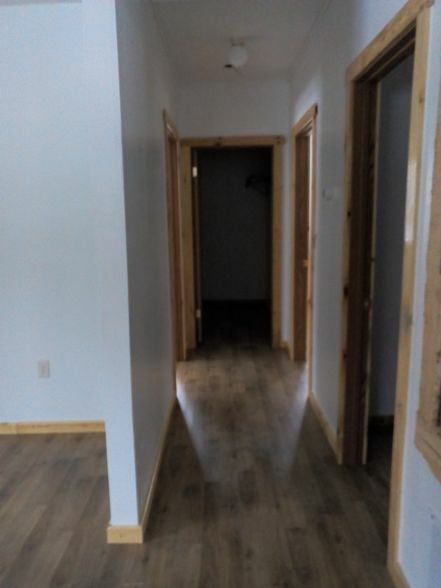 Anyways, the improvements on the building seem to be slow but I think that is because it is so big and there are so many things that have to be done, but each day when we accomplish a few tasks it just gets us closer to being done. 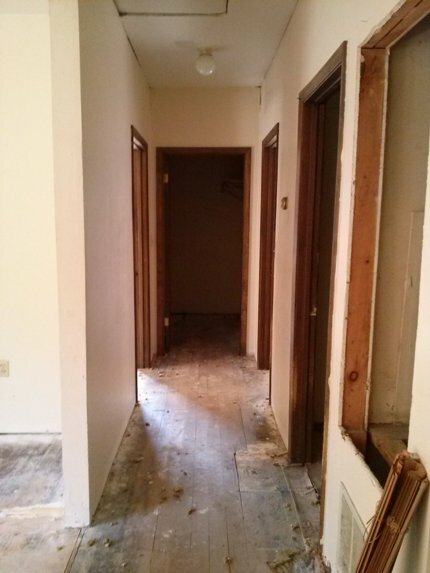 We are finally seeing the light at the end of the tunnel in regards to getting the upstairs apartment finished. The painting has been finished (except for the closets which I will do tomorrow), flooring is 90 percent installed, new windows are in with custom framing (courtesy of Rick’s talents), and door and floor trim are installed as we get doors and floors in (I’ll give that an 80 percent completion rate). Tons and tons of little stuff like hooking up water, installing cabinets, laying floor tile and getting the furnace running will work themselves out as we get to the finish line. 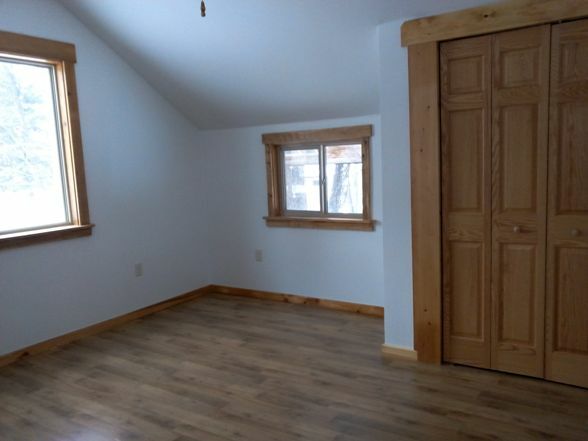 There is one room that is completely finished. I think we are also done hauling away construction debris. The last load went bye bye today. According to Rick’s estimates, we hauled over 20 tons of materials to the dump. This number would have been much higher if we hadn’t burned what we could and salvaged as much wood and other items as we did. 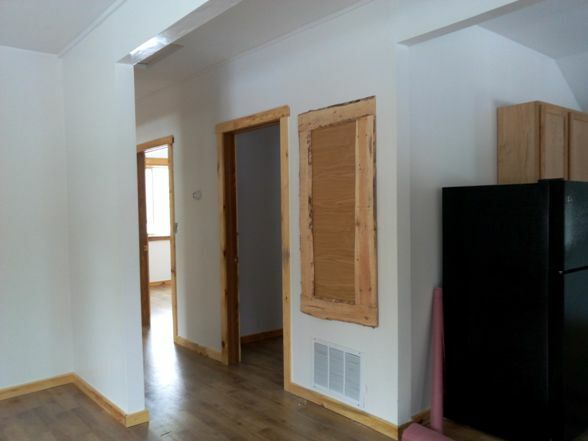 All that wood that we did manage to save has been reborn into trim around the windows, doors and baseboards. It was run through the surface planer, trimmed, routered and coated with polyurethane to bring out it’s natural beauty. As of this afternoon, that gallon can of poly is gone. 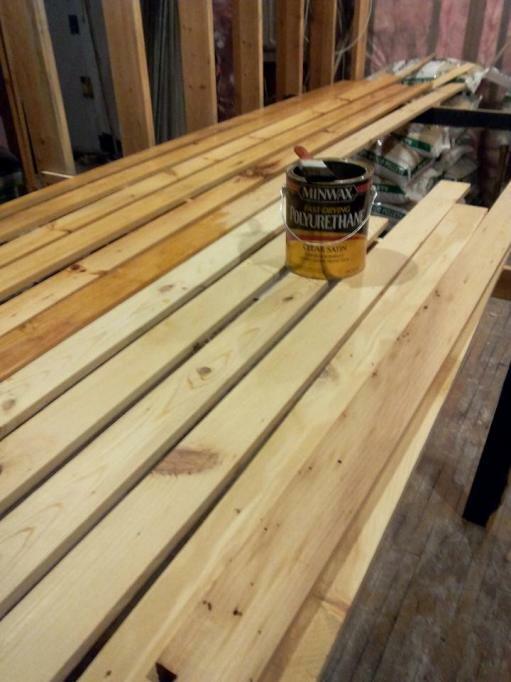 All of it used on wood for the upstairs. Don’t worry, I picked up another can today. We haven’t been devoting all of our time on the upstairs, because the downstairs has been getting a little loving too. 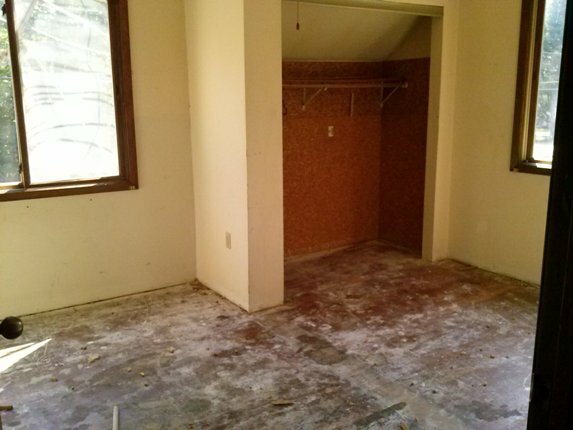 Huge room, huge job, and our friend Chris is doing fantastic work!! 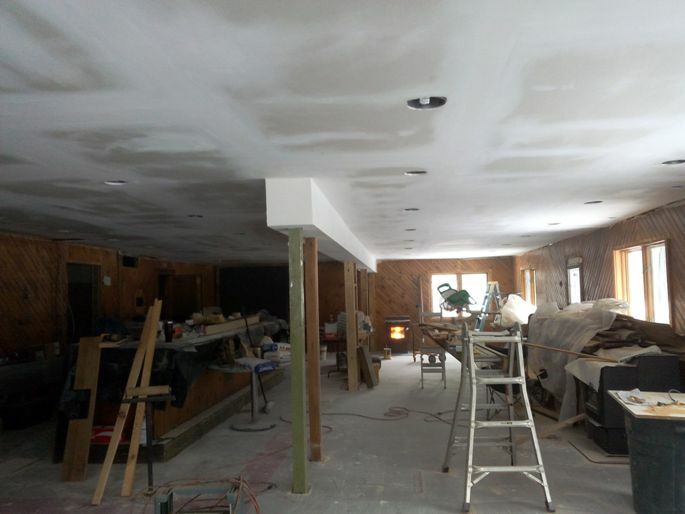 I’ve started up a Facebook page to keep everyone informed of the progress and get pumped up for the opening of the coffee shop next Spring. Sometimes it’s easier to post little snippets of what’s going on when your brain isn’t working too well from exhaustion. Or it could be from breathing fumes from the polyurethane. It’s funny how a scent can awaken memories. Although it is not officially Fall on the calendar, the Northwoods is awash with colorful leaves that brighten up the cool days and even cooler evenings. As my woodburner is coming out of hibernation, the smells of the wood burning mix with the aroma of the bread that has just come out of the oven. These same smells are what I first experienced when I came up to the Rez for the first time many years ago. There may not have been bread involved, but I certainly remember the smell from the fire at the gathering that we went to. I remember the people I met, not knowing that they would become good friends over the years. There were greetings spoken in a different language that is now second nature to me. The foods that were served that seemed so foreign at the time are now mouthwatering dishes that we look forward to eating. 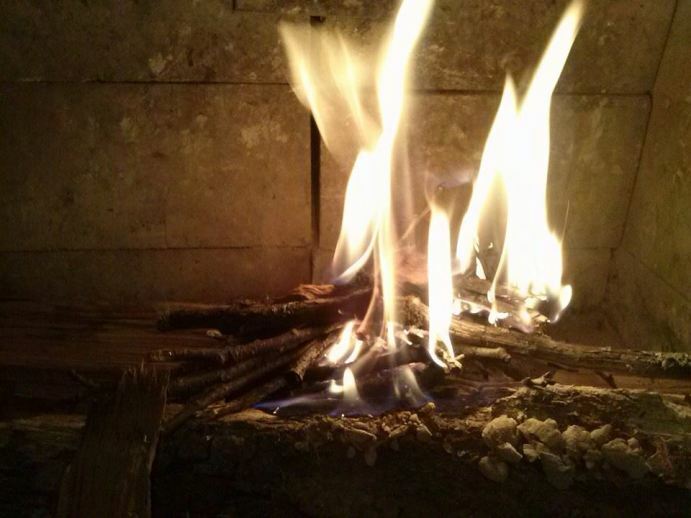 But it’s that smell of wood burning that is the strongest memory of all. It seems to tie everything from the past together. Enjoy the smells of Fall, my friends and see what memories they bring forth for you!